The big white knob on Nicky Romero's studio desk is the Dangerous Music Monitor ST. He tweets "Hottest studio gear atm : dangerous. Remote ST I'm hooked!" In this picture of Afrojack's studio you can see Martin Garrix toying around with the Dangerous Music Monitor. Throughout the video, you can see the Dangerous Music Monitor ST being used for monitoring in Zedd's new home studio. In this video on Diplo's Instagram, his Dangerous Music Monitor ST Remote-Controlled Source & Speaker Switcher can be seen. "For summing, I use all Symphony I/O outputs that go into a Dangerous 2-Bus summing box." The Dangerous Music Monitor ST is the gold standard for studio reference. Input source selection, speaker switching, cue system, talkback functions, and headphone amplification are all neatly tucked into one rack space and controlled via the comprehensive, customizable remote. As with every Dangerous Music product, painstaking measures are taken to create complete functionality with ZERO audio compromise. Expansion to 5.1 and beyond is simple: just add the Monitor SR and/or the Additional Switching System. The Monitor ST solves the conundrum of today's complex monitoring world, without masking reality. The Dangerous Music Legacy: "Audio Integrity: non-negotiable." This is the credo upon which Dangerous Music is founded. Conceived and designed by end users-not by engineers in lab coats--the results are products that resurrect dynamic range, punch, intelligibility and emotion. These high-fidelity, uncompromised signal paths are achieved by harnessing over 20 years of Chris Muth's design wizardry; creator of infamous custom black boxes for world class facilities like Hit Factory, Masterdisk, Absolute Audio and Sterling Sound Mastering. Then the critical listening skills of golden-eared luminaries are applied, with the result being musical tools that fulfill the actual needs of today's flexible computer based studio. Is Your Audio A Hostage?Monitoring is the most crucial stage in the audio chain. An inferior system facilitates poor mix decisions by forcing you to compensate for its shortcomings. For example, if transients are choked by cheap components and weak designs, the high-end you added to the mix will spike like Mount Everest in the real world. When evaluating a new microphone, preamp or EQ, how can you judge their performance without honest monitoring? The Monitor ST is the outcome of real world experience combined with mastering grade components. Don't let a lesser monitor rig hold your audio hostage. Talkback Mic â?¢ Feature: Not to be confused with how you behaved in high school, the talkback mic & level injects the microphone into the headphone cue system. â?¢ Benefit: Avoid jerry-rigging a separate means of communication to the artist (i.e. Carrier Pigeon, Smoke Signals, Semaphore..) Save a ton of time, which you can bill for. Power Indicator â?¢ Feature: Visual indication proving that the unit is powered up. â?¢ Benefit: Save an hour of your life by determining that the AC outlet is dead, not your gear. Headphone Monitoring â?¢ Feature: 20 watts of pristine tympanic m e m b r a n e - m o v i n g headphone amplification. â?¢ Benefit: Miles of headroom, to audition intelligibly and feel the music. â?¢ Tip: Drive a Redco Little Red Cuebox from the cue amp out on the rear panel OR from here! Main To Cue â?¢ Feature: Sends the selected control room mains audio to the cue amp & phones outputs. â?¢ Benefit: Master mix perfect for the cue mix? Don't reinvent the wheel, just pipe it into the cans and open up your own can of something to celebrate. Aux Input To Cue - To Main â?¢ Feature: Send the aux input to cue, CR speakers or both. This is a separate audio path from the main inputs. â?¢ Benefit: (1) Set up and monitor a separate cue mix for the talent (2) Monitor the computer's headphone jack to audition sample libraries or audibly monitor software updates. Input 4 Level â?¢ Feature: Turn down the level on input 4 as necessary. â?¢ Benefit: Match a mastered CD's input level with the current project mix for an honest A/B. Aux Inputâ?¢ Feature: Alternative input. â?¢ Benefit: Mult the vocal mic/EQ/comp signal being fed to the DAW into Aux Inputs for latency free cue mix vocals. â?¢ Tip: Feed the audio output of your Mac into the Aux input to audition sample libraries and hear computer alert beeps. Remote Mic Input â?¢ Feature: Use an external mic for the TB system instead of the built-in mic. â?¢ Benefit: Want the rack unit in the machine room or an Iso-box? No problem - jack in a mic, run some cable and go. Analog Input & Outputâ?¢ Feature: Inputs and outputs are accessed on DB25 connectors. â?¢ Benefit: (1) Screw in connectors avoid mishap and agony (2) Better surface area contact than balanced 1/4" jacks makes for more excited electrons (3) Wired to Tascam/Digidesign standard for simple cable procurement. DC inâ?¢ Feature: External Power Supply Input connector â?¢ Benefit: Keeping the supply away from the audio components improves noise performance. â?¢ Tip: Plug in here first and then into the wall (always good PSU etiquette). TB Remote â?¢ Feature: producer remote talkback switch â?¢ Benefit: Allow the session producers to have their own immediacy of communication. â?¢ Tip: Wire it yourself (details in the manual) or order a Dangerous TBREM. Slate â?¢ Feature: The slate output feeds the talkback mic to the DAW or external powered speakers â?¢ Benefit: Stripe audio notes on the session or feed an external cue system. Cue Amp Out â?¢ Feature: Send the headphone mix to a remote headphone distribution box. â?¢ Benefit: 20 watts of pure power that may be distributed for up to 16 pairs of headphones. â?¢ Tip: Check your headphone impedance before trying that many. Remote â?¢ Feature: Connect the remote via Ethernet CAT 5e shielded cable. â?¢ Benefit: Replacement or extension cable is easy to find. â?¢ Tip: Run up to 100 feet! Momentoggleâ?¢ Feature: Press and hold a button and it will deselect when released. Press and release a button and it will latch. â?¢ Benefit: talkback, mono, solo, mute, dim buttons can all either latch or release (fewer finger fractures). Setup Button â?¢ Feature: Start here to alter input gains, speaker system gains, subwoofer enabling, level offsets, and filtering options. â?¢ Benefit: Dial in the monitoring system to work the way you love to, not the way the gear demands. Gain Buttonâ?¢ Feature: Brings -10dBV devices up to +4dBu pro level as selected. â?¢ Benefit: Monitor from your computer output, iPod, DVD player, etc. without massive volume knob compensation. Mono Buttonâ?¢ Feature: The mono switch combines the left and right channels to the monitors. â?¢ Benefit: Quick phase check. After all, 2/3rds of the world still listens in mono (not to mention every club's system). Aux To Main â?¢ Feature: Send the aux input to the control room speakers. â?¢ Benefit: (1) Check the click track (2) Monitor the computer's headphone jack to audition sample libraries or audibly monitor software updates. â?¢ Tip: The input 4 level knob on the rack unit determines the level. Link the aux and TB-in setup mode for a listen-back mic in the live room. Analog Inputs â?¢ Feature: Silently switch between four analog sources. â?¢ Benefit: Need to compare that commercial CD with your own? Turn down the CD player's level on input 4, to match your unmastered version. Talkback Switch â?¢ Feature: The TB switch injects the microphone into the headphones while dimming the control room speakers, or not. â?¢ Benefit: Avoid jerry-rigging a separate means of communication to the artist (i.e. Baseball hand signals...) Dim Switchâ?¢ Feature: Forget what your boss calls you; hit this to lower the monitoring volume by -18dB. â?¢ Benefit: Instantly drop & resume listening levels. Up / Down / Bank â?¢ Feature: Select level offsets for speakers and inputs during setup. Pick any bank to address up to four additional switching system modules. â?¢ Benefit: Expand your system and receive visual confirmation of the unit being addressed via LEDs. PPI button â?¢ Feature: Producer Pacification Indicator. â?¢ Benefit: Dealing with thorny producers who want "one more" version of your perfect mix? Toggle between the blue and clear modes, then print whichever pass they select. After all, they're identical. Speaker Selection â?¢ Feature: Noiselessly switch between 3 different sets of monitors. Choose to add a sub (or don't) & drop in the low-pass filtering option if desired. â?¢ Benefit: Buy one sub to share across 3 systems with complete level programmability. â?¢ Tip: Use the onboard filter with full range monitors where you only need the sub to handle the extreme low end. Additional Switching â?¢ Feature: Select the inputs or functions on each additional switching system module. â?¢ Benefit: Future proof audio expansion and control by adding up to 4 additional switching system modules. Speaker Mute/Solo â?¢ Feature: mute & solo any speaker or speaker combination. â?¢ Benefit: Check your mix for anomalies. Finally, troubleshooting is untroubled. Analog Stepped Attenuator Control â?¢ Feature: No DCA's or VCA's employed. â?¢ Benefit: Pristine channel tracking accuracy and repeatable to 0.02dB! â?¢ Tip: Determine the optimum Fletcher Munson mix level & repeat it anytime. Shown at 7:08 in this mixing tutorial. Next to his MacBook Pro, MAKJ's Dangerous Music Monitor ST Remote-Controlled Source & Speaker Switcher. In this photo on Wildstylez' Instagram, you can see the Dangerous Music Monitor ST on his' desk, below the screen. In this studio photo, the Dangerous Music Monitor ST Stereo Monitor Control system can be seen in Cedric Gervais' studio. He says, "Very productive week 2 songs done loving my new studio." The photo was posted to Cedric's Instagram August 2014. The remote control portion can be seen on top of his desk, between what looks like a Virus synth module and his Mac keyboard. The actual system looks to be mounted on a rack to the right of the remote control. In this Twitter photo, the Dangerous Music Monitor ST Remote-Controlled Source & Speaker Switcher can be spotted on the desk. The remote control can be seen on the left part of the screen lying on the desk at around 0:18. The rackmount interface itself can be seen in the top rack space behind him at 0:18. At 0:27 if you look in the bottom left corner clearly there is a Dangerous music monitor. Many other artists use this such as oe of my favorites Tujamo. I saw that he had this on his equipboard, so I looked at the peice of equipment and saw that it matched the one in the video. This can be seen on Kesi's desk in this instagram post. In the image that overwerk posted on his instagram, he took a picture of his desktop. On his desktop he has the Dangerous Music Controller. At the beginning of this video one can see Bas Oskam from Noisecontrollers playing piano. On top of the desk is the Monitor ST Remote. In addition, the ST Remote can be seen in [this photo](http://www.q-dance.com/australia/en/news/noisecontrollers-studio-session-send-your-question/) of Bas Oskam. In the left side of the pic we can see the item. if you see closely in this photo,you see the st remote! In this Instagram photo, Tujamo is seen turning a dial on the Dangerous Music Monitor system. 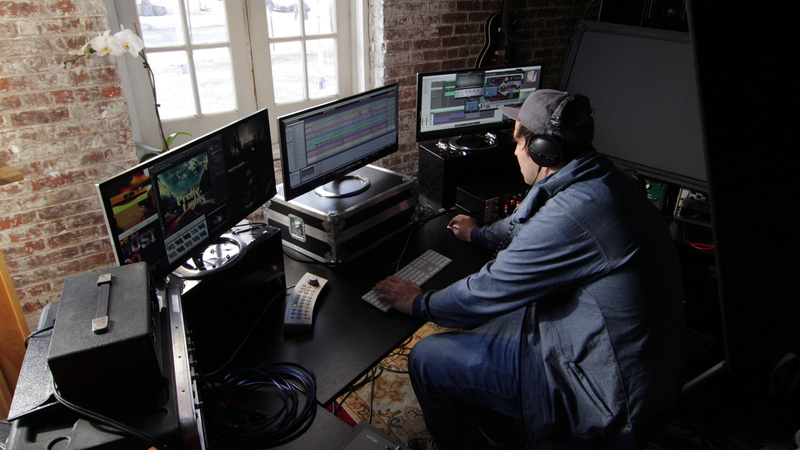 You can see the controller to the left of his Midi keyboard in front of his screen. It’s used as a monitor controller so you can hear your mix and also single out certain monitors if you want and hear their individual mix. The Dangerous Music Monitor ST is the gold standard for studio reference. Input source selection, speaker switching, cue system, talkback functions, and headphone amplification are all neatly tucked into one rack space and controlled via the comprehensive, customizable remote. As with every Dangerous Music product, painstaking measures are taken to create complete functionality with ZERO audio compromise. Expansion to 5.1 and beyond is simple: just add the Monitor SR and/or the Additional Switching System. The Monitor ST solves the conundrum of today's complex monitoring world, without masking reality. "Audio Integrity: non-negotiable." This is the credo upon which Dangerous Music is founded. Conceived and designed by end users-not by engineers in lab coats--the results are products that resurrect dynamic range, punch, intelligibility and emotion. These high-fidelity, uncompromised signal paths are achieved by harnessing over 20 years of Chris Muth's design wizardry; creator of infamous custom black boxes for world class facilities like Hit Factory, Masterdisk, Absolute Audio and Sterling Sound Mastering. Then the critical listening skills of golden-eared luminaries are applied, with the result being musical tools that fulfill the actual needs of today's flexible computer based studio. Is Your Audio A Hostage?Monitoring is the most crucial stage in the audio chain. An inferior system facilitates poor mix decisions by forcing you to compensate for its shortcomings. For example, if transients are choked by cheap components and weak designs, the high-end you added to the mix will spike like Mount Everest in the real world. When evaluating a new microphone, preamp or EQ, how can you judge their performance without honest monitoring? The Monitor ST is the outcome of real world experience combined with mastering grade components. Don't let a lesser monitor rig hold your audio hostage. â?¢ Feature: Not to be confused with how you behaved in high school, the talkback mic & level injects the microphone into the headphone cue system. â?¢ Benefit: Avoid jerry-rigging a separate means of communication to the artist (i.e. Carrier Pigeon, Smoke Signals, Semaphore..) Save a ton of time, which you can bill for. â?¢ Feature: Visual indication proving that the unit is powered up. â?¢ Benefit: Save an hour of your life by determining that the AC outlet is dead, not your gear. â?¢ Feature: 20 watts of pristine tympanic m e m b r a n e - m o v i n g headphone amplification. â?¢ Benefit: Miles of headroom, to audition intelligibly and feel the music. â?¢ Tip: Drive a Redco Little Red Cuebox from the cue amp out on the rear panel OR from here! â?¢ Feature: Sends the selected control room mains audio to the cue amp & phones outputs. â?¢ Benefit: Master mix perfect for the cue mix? Don't reinvent the wheel, just pipe it into the cans and open up your own can of something to celebrate. â?¢ Feature: Send the aux input to cue, CR speakers or both. This is a separate audio path from the main inputs. â?¢ Benefit: (1) Set up and monitor a separate cue mix for the talent (2) Monitor the computer's headphone jack to audition sample libraries or audibly monitor software updates. â?¢ Feature: Turn down the level on input 4 as necessary. â?¢ Benefit: Match a mastered CD's input level with the current project mix for an honest A/B. Aux Inputâ?¢ Feature: Alternative input. â?¢ Benefit: Mult the vocal mic/EQ/comp signal being fed to the DAW into Aux Inputs for latency free cue mix vocals. â?¢ Tip: Feed the audio output of your Mac into the Aux input to audition sample libraries and hear computer alert beeps. â?¢ Feature: Use an external mic for the TB system instead of the built-in mic. â?¢ Benefit: Want the rack unit in the machine room or an Iso-box? No problem - jack in a mic, run some cable and go. Analog Input & Outputâ?¢ Feature: Inputs and outputs are accessed on DB25 connectors. â?¢ Benefit: (1) Screw in connectors avoid mishap and agony (2) Better surface area contact than balanced 1/4" jacks makes for more excited electrons (3) Wired to Tascam/Digidesign standard for simple cable procurement. â?¢ Benefit: Keeping the supply away from the audio components improves noise performance. â?¢ Tip: Plug in here first and then into the wall (always good PSU etiquette). â?¢ Benefit: Allow the session producers to have their own immediacy of communication. â?¢ Tip: Wire it yourself (details in the manual) or order a Dangerous TBREM. â?¢ Benefit: Stripe audio notes on the session or feed an external cue system. â?¢ Feature: Send the headphone mix to a remote headphone distribution box. â?¢ Benefit: 20 watts of pure power that may be distributed for up to 16 pairs of headphones. â?¢ Tip: Check your headphone impedance before trying that many. â?¢ Feature: Connect the remote via Ethernet CAT 5e shielded cable. â?¢ Benefit: Replacement or extension cable is easy to find. â?¢ Tip: Run up to 100 feet! Momentoggleâ?¢ Feature: Press and hold a button and it will deselect when released. Press and release a button and it will latch. â?¢ Benefit: talkback, mono, solo, mute, dim buttons can all either latch or release (fewer finger fractures). â?¢ Feature: Start here to alter input gains, speaker system gains, subwoofer enabling, level offsets, and filtering options. â?¢ Benefit: Dial in the monitoring system to work the way you love to, not the way the gear demands. Gain Buttonâ?¢ Feature: Brings -10dBV devices up to +4dBu pro level as selected. â?¢ Benefit: Monitor from your computer output, iPod, DVD player, etc. without massive volume knob compensation. Mono Buttonâ?¢ Feature: The mono switch combines the left and right channels to the monitors. â?¢ Benefit: Quick phase check. After all, 2/3rds of the world still listens in mono (not to mention every club's system). â?¢ Feature: Send the aux input to the control room speakers. â?¢ Benefit: (1) Check the click track (2) Monitor the computer's headphone jack to audition sample libraries or audibly monitor software updates. â?¢ Tip: The input 4 level knob on the rack unit determines the level. Link the aux and TB-in setup mode for a listen-back mic in the live room. â?¢ Feature: Silently switch between four analog sources. â?¢ Benefit: Need to compare that commercial CD with your own? Turn down the CD player's level on input 4, to match your unmastered version. â?¢ Feature: The TB switch injects the microphone into the headphones while dimming the control room speakers, or not. Dim Switchâ?¢ Feature: Forget what your boss calls you; hit this to lower the monitoring volume by -18dB. â?¢ Benefit: Instantly drop & resume listening levels. â?¢ Feature: Select level offsets for speakers and inputs during setup. Pick any bank to address up to four additional switching system modules. â?¢ Benefit: Expand your system and receive visual confirmation of the unit being addressed via LEDs. â?¢ Feature: Producer Pacification Indicator. â?¢ Benefit: Dealing with thorny producers who want "one more" version of your perfect mix? Toggle between the blue and clear modes, then print whichever pass they select. After all, they're identical. â?¢ Feature: Noiselessly switch between 3 different sets of monitors. Choose to add a sub (or don't) & drop in the low-pass filtering option if desired. â?¢ Benefit: Buy one sub to share across 3 systems with complete level programmability. â?¢ Tip: Use the onboard filter with full range monitors where you only need the sub to handle the extreme low end. â?¢ Feature: Select the inputs or functions on each additional switching system module. â?¢ Benefit: Future proof audio expansion and control by adding up to 4 additional switching system modules. â?¢ Feature: mute & solo any speaker or speaker combination. â?¢ Benefit: Check your mix for anomalies. Finally, troubleshooting is untroubled. â?¢ Feature: No DCA's or VCA's employed. â?¢ Benefit: Pristine channel tracking accuracy and repeatable to 0.02dB! â?¢ Tip: Determine the optimum Fletcher Munson mix level & repeat it anytime. Really dig for clear signal path . Must have equipment for those with complex studios. This would make everything more conveinent.